You are currently browsing the archive for the tote purse bag category. I’ve never been one of those big blingy purse carriers. Oh sure, I’ll carry a tote or my backpack if I’m cargo ladened, but usually I have my cell phone in my left jean pocket, my wallet in my right jean pocket and I’m good to go. If I carry a purse I want one that’s small and cute. 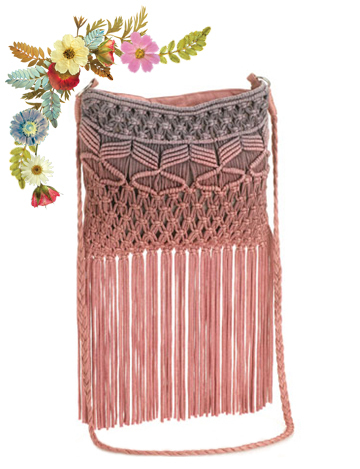 So I’m simply adoring this “Ombre Macrame Crossbody Bag” available on Monsoon. Love the little size, about 9″ wide x 8″ high, and I love a little zipper that keeps things from spilling out into my car.